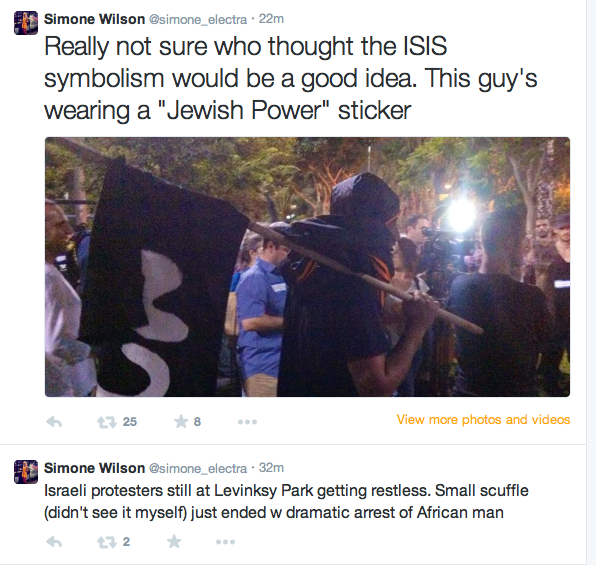 A group of right-wing Jewish Israelis, including former Knesset (Parliament) members, held a protest in Tel Aviv on Saturday chanting racist slogans against African immigrants and waving ISIS-style black flags. The flags had on them the word 'High Court' in Hebrew, written in the style used by the right-wing 'Islamic' group calling itself ISIS that has taken control of parts of Iraq and Syria. Protest organizers said that they were meant to draw attention to a decision by the Israeli Supreme Court to allow immigrants out of a detention camp where they were being held. The detention facility, called Holot, was located in the Negev desert, and was used to house asylum seekers from Africa, none of whom had committed any crime except having attempted to seek refuge from conflicts in their home countries. The march went from Hatikva neighborhood to Lewinsky Park, an area where a population of African immigrants live, and where many of the white Jewish Israelis who also live in the area have protested the presence of their African neighbors on many occasions. Leading the march was right-wing settler leader Baruch Marzel and Mai Golan, who openly declared in a march two years ago, “I am a proud racist” - then running for city office and winning soon afterward. The march follows an ongoing Twitter campaign in which supporters of Palestine have compared Israel to ISIS, dubbing it #ISIL – The Israeli State of Israel in the Levant. They have posted pictures and examples of Israeli soldiers and settlers carrying out atrocities and actions against civilians based on religion, pointing out parallels between these actions and those of ISIS in Iraq and Syria. Prominent Knesset members propose curbing the powers of Israel's High Court following Monday's ruling that upended official policy concerning asylum seekers by ruling legislation illegal. The court ruled, in the wake of a petition filed by six human rights groups, that the law allowing asylum seekers to be jailed for up to one year without trial is illegal. The court further declared that that Israel must shutter the "open" Holot detention facility, where asylum seekers who entered Israel illegally are detained for indefinite periods with no grounds for release. The Knesset will now embark on what Israeli news portal ynet has dubbed a "fight" against the High Court. Already next week, at the opening of the Knesset's winter session, the ministerial legislative body will debate a proposal by Ayelet Shaked (Jewish Home) to amend the Basic Law: Human Dignity and Liberty in order to abridge the court's power to overturn legislation. Basic laws fulfill constitutional functions in Israel, a country without such a foundational document. Faction chairperson for the Jewish Home Shaked further wishes to alter the way in which judges are selected to ensure a "balance" between so-called judicial activists and others. Outgoing Interior Minister Gideon Sa'ar, who guided the legislation struck down, noted that "This is a mistake, leaving Israel without tools to deal with the phenomenon of illegal infiltration. We need to re-examine the High Court's authority" on such issues". The High Court justices “despise the basic principle that Israel is a Jewish state with a democratic government,” and the Knesset must “wake up and act quickly and determinedly to change the way judges are selected...so that we get judges with values who are committed to the future of Israel,” Levin said. Knesset Internal Affairs and Environment Committee chairman Miri Regev (Likud) called the ruling shameful. “The court’s decision is essentially calling everyone in Africa to come to Israel, because infiltrators can move around freely", Regev, who in 2012 called Sudanese immigrants a "cancer in our body" told the press. Israel's population and immigration authority estimates there are 47 thousand asylum seekers in Israel, of whom 35,000 are from Eritrea and Sudan. The court ruled that the overturned legislation "violates human rights in an essential, deep and fundamental way". Writing the majority opinion, Justice Vogelman stated that "We didn't do this voluntarily. We did it because it's our obligation". 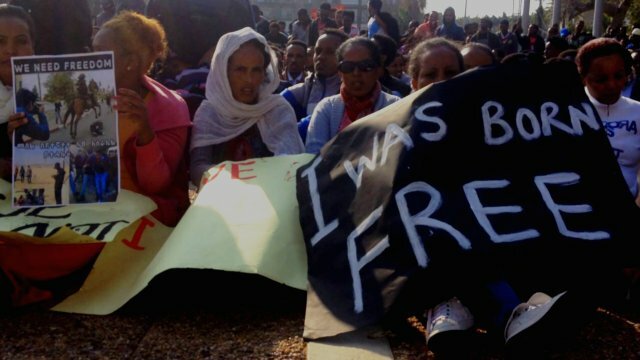 An estimated 2,200 asylum seekers from Eritrea and Sudan are currently held at Holot, an "open" facility as detainees are allowed to leave during the day, although they must be present for three daily head counts and are prohibited from working. The majority ruling also said the court had not ignored the distress of residents of south Tel Aviv, where the majority of the asylum seekers live, but that violating asylum seekers’ rights could not be the solution to this problem. Already last night tens of south Tel Aviv residents erected a "mourning tent" to which right-wing politicians, who participate in the governmental neglect of the area while encouraging blame of asylum seekers for the residential problems, began going. The human rights organizations which petitioned the High Court welcomed the ruling, noted that "It's time for a real solution that will benefit both residents of south Tel Aviv and the asylum-Seekers". A statement issued by the groups asserted that "The Court made it clear today, once more, in a categorical and unequivocal manner, that the policy toward asylum-seekers cannot be solely based on mass detention of innocent people or complete disregard of the issue. We call on the government: This is the time to act for the mutual benefit of residents of southern Tel Aviv and asylum-seekers - by investing money in improving the infrastructure, welfare and health services in neighborhoods where many asylum-seekers reside, and by working to decrease the density of population in those areas by granting asylum-seekers work permits and encouraging Israelis to employ them". Israeli police have raided a protest camp near the Israeli-Egyptian border, arresting the 1,000 African asylum seekers protesting there, and injuring dozens. A group of asylum seekers, mainly from Eritrea and Sudan, left Israel's Holot detention centre on Friday in a mass act of civil disobedience. Opened six months ago, the detention facility is referred to by the government as an "open prison". Detainees are forced to participate in a head count three times a day, can’t work or study, and live under harsh conditions. Since the detention facility was set up, Israeli immigration police have imprisoned more than 2,500 African asylum seekers under the country's so-called "Infiltrators Law", which allows Israel to detain, without charge or trial, migrants who have entered the country without legal documentation. The Israeli Ministry of Interior does not process individual asylum requests; according to human rights groups, the country has recognised less than 200 asylum seekers as refugees since its creation in 1948. The detainees decided to march towards the Israeli-Egyptian border, only a few kilometres from Holot, to demand that Israel and the international community recognise in their refugee status, or alternatively allow them to go to Egypt, where most travelled to Israel from. The Israeli army and police forces prevented the marchers from advancing to the border, and a temporary camp was established nearby. Forty-eight hours later, Israeli immigration police were sent to the camp in large numbers, forcibly boarding all the protesters on a bus, and returning them to prison.